It’s not every day when you can safely call a band “musical explorers”, but in Amsterdam’s progressive rock masters Modest Midget’s case, no one can DENY the claim. Bravely embracing new intellectual and spiritual frontiers is the name of the game for founder Lionel Ziblat and his musical cohorts Artis Orubs, Emiel de Jong, and Tristan Hupe. And what’s more, it seems to come effortlessly. Fans of artists from The Beatles and early Pink Floyd to Frank Zappa, Mike Patton and King Crimson will find Modest Midget’s musical and lyrical prowess fascinating and rewarding on many levels, as I did. “Contemporary Ache” is a definite highlight of the album, and it’s the first full track offered here. It’s also nothing less than a prog rock masterpiece in and of itself. From the imposingly dissonant opening guitars to the desperately communicative lyrics, this is everything great music should and can be. Thought provoking and inspiring. The music’s sonic jetpack makes sure that the lyrics are given extra weight, and the song never comes down from the sky once during its 5:18 length. Another highlight is “Troubles in Heaven”, which features brilliantly placed vocal harmonies over whimsical and playful music. This is really where the band comes across as a perfect blend of System of a Down and indie rock music. “Back from My Trip” is hypnotic, and atmospheric. It seems to up the ante every 10 seconds or so, as more layers unfold seemingly without limit. Lyrically, it’s a fascinatingly humorous tale of misfortune, and it’s funnier still that words of caution could sound so soothing. “Home Seek” displays a heavy Sergeant Pepper psychedelic influence, which is something more artists would do well to re-imagine. “Here I Go” picks up the pace with some upbeat Eastern-inspired rock and some wild keyboards/guitars. What else would you expect from classically trained experimental artists? “Buy Me!” and “The Last Straw” are also essential listening, and typically polarized, with one being driving and catchy while the other is haunting and sobering. And yet, it all fits together perfectly. All in all, this album deserves to be called great, and I’d be surprised if anyone familiar with progressive music would have negative things to say about it. Even though the band is composing mind blowing material, it’s also accessible and catchy. I, for one, am now anxiously awaiting Modest Midget’s next release. This is a brilliant band that deserves every bit of acclaim they get. 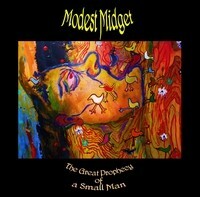 “The Great Prophecy of a Small Man” should be essential listening for all serious music listeners.